Whenever someone utters the word ‘Himalaya’, a spiritual thought strikes an Indian’s mind. Since time immemorial it has been described as the king of mountains and its placid grounds have been favourite the meditation spots of several sages. Later, under the patronage of kings of different eras, several temples were built on its different levels some of which are known today among the major pilgrimage travel destinations in the country. But, while discussing about the popular sites, several Himalayan temples get overlooked. 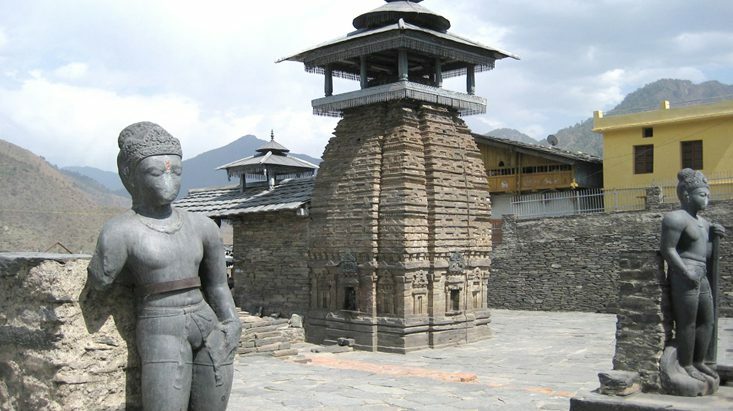 A temple dedicated to Lord Shiva and Goddess Parvati, Lakhamandal dates back to the days of the Mahabharata. Located at a distance of around 107 kms from Dehradun & 77 kms from Mussoorie, this is a temple made of wonderful stone carvings with two statues placed outside. The Shivalinga of this temple is made of graphite and glows when water is poured on it. It is said that during the exile of the Pandavas, they lived in this part of Garhwal Himalaya. When Duryadhon came to know about it, he made a rest house full of shellac to kill them all together. But the Pandavas with the help of Krishna managed to escape through a secret cave. The end part of the cave is at a distance of 2 km from the temple. Set amidst a refreshing natural setting with cloud and lofty mountains all around, Kartik Swami is the temple dedicated to Shiva’s elder son Kartikeya. Located at an elevation of 3048 m above sea level in Rudraprayag district of Uttarakhand, this revered temple can be reached by a 3 km trek from the Kanak Chauri Village. It is said that when Lord Ganesha got the right of being worshipped first by winning the competition with his intellectual deeds, Kartikeya gave his flesh to his father Shiva and bones to his mother. It is believed that the bones of Kartik are seen on his stone idol found inside the temple. The marble type stone idol of lord Kartikeya is believed to be formed naturally. Kartik Purnima in November and the 11 day long Kalash Yatra in June are the two most famous festivals of Kartik Swami Temple. Located in Niti Valley of Chamoli district of Uttarakand, Timmar Sain is a natural cave temple of Lord Shiva. From Niti Village it is around 3-4 km and the route leading towards the temple offers an opportunity of trekking as well. Tourists should remember that Niti Village is the last village on the Indo-Tibet border and requires special permission from Govt. to visit this area. Mahasu Devata temple is located at an elevation of 5000 ft above sea level on the Tuini-Mori road at Hanol. The deity of Mahasu is worshipped by the people of Hanol Village who live on the eastern bank of the Tamas. According to myths the central deity of the temple Mahasu was found by a farmer while ploughing his field. It was one of the four Shivalingas, the others being Pavasi, Vasik and Chalda, that he found on the field. Mahasu is nothing but an incarnation of Lord Shiva who is believed to be the purifier of all sins and destroyer of evils. A temple dedicated to Mahabali Hanuman, the temple of Sidh Bali is perched on a small hillock on the banks of Khoh River. Located in Kotdwar town of Garhwal district of Uttarakhand the temple is around 76 km from Haridwar. With a picturesque natural view at the backdrop and exceptional height, the temple looks unbelievably outstanding. The temple is painted in all orange colour which is believed to be the favourite colour of lord Hanuman. A heavily ornamented stone idol of Lord Hanuman is worshipped in the sanctum sanctorum. A temple dedicated to Dhari Devi, the guardian deity of Uttarakhand is situated on a 20m elevated rock by the pristine river Alakananda. An incarnation of Goddess kali this deity is believed to be the protector deity of Char Dham. After travelling 19 km from Srinagar (Pauri Garhwal) towards Kaliya Saur on Srinagar-Badrinath highway one needs to trek down another half a kilometer towards Alaknanda River to reach this magnificent temple. The most attractive part of this temple is the idols which are placed under open sky instead of a sanctum sanctorum. One of the lesser known yet utterly divine Hindu Religious places in Garhwal region, Surkanda Devi is a Shakti Peeth dedicated to Goddess Bhavani. Legends say that when Vishnu cut down the corpse of Sati into different pieces, her head fall on this part resulting in the transformation of this land into a divine spot or a famous ‘sidh peeth’. It is located at an elevation of 3000 m above sea level near Kaddukhal Village. The grand local fair held here during the month of June is a popular festival of this region. Kunjapuri Devi temple is dedicated to deity Durga, one of the 13 most important Goddesses of Shivalik Range. A must see Uttarakhand pilgrimage site, this temple is located at an elevation of 1645 m above sea level and gives one a chance to sight the Himalayan peaks that lies to the north. When travelling on Gangotri road one needs to reach Narendra Nagar where at Hindola Khal the route gets divided. The shrine is 5 km further. Navaratri is the ideal time to visit this place. A popular deity of both Garhwal and Kumaon region in the state of Uttarakhand, Nanda Devi, the manifestation of Goddess Parvati, is worshipped as the daughter of this region. A typical Himalayan temple with rectangular dome and stone carvings on it, Nanda Devi is located in Almora district. During Navratri, a grand festival is held where the dance programmes performed by the local youth is a must see sight. Every 12 years Nanda Devi Raj Jat (Yatra) is organised when Goddess Nanda is decorated with ornaments and along with food and clothing she is sent to her home Trishul Peak. During this yatra music, folk songs and dances are staged which is an unforgettable sight to behold. During Baisakhi a grand celebration takes place in this region when after a long winter break the central deity is shifted to the main temple. ‘Chandra’ means moon and ‘badan’ means body so the literal meaning of this term is a deity with a fair complexion like moon. The temple is dedicated to Durga, the supreme deity. It is also one of the Shakti Peethas found in Garhwal Himalaya where the torso of Sati is worshipped. The temple can be reached from Kandikhal en-route Srinagar-Tehri. It is around an 8 km walk to the temple from this stop. During the month of April a big fair takes place in this region. A Shakteepith situated on the bank of Nawalika River, Jwalapa Devi is a famous Hindu Shrine at a distance of 34 km from Pauri Town on Pauri-Kotdwar Road. According to legends, the daughter of the demon king Pulom won the heart of Deity Durga performing hard meditation and wanted to get Indra, the king of Gods as her husband. The deity appeared on the same place in the form of a burning flame (Jwala) and the temple is thus named after her. Every year, on the occasion of Navaratri, a special puja is arranged. A temple in Chamoli Gopeshwar, Gopinath is the abode of Lord Shiva. An ideal place to seek mental peace, this temple is offered with a picturesque natural view. A Svayambhu linga (autogenous pillar) is worshipped here as the incarnation of Shiva. The temple is built in Nagara Style with a Latina Shikhara. It is believed that people visiting this sacred place get rid of all their sins. There are several other religious spots in and around the Garhwal region where devotees from across the country head to with full faith on the supreme soul. Pilgrims visiting the holy sites believe that deities fulfill their wish only if they surrender themselves unequivocally to the deity. Most of the temples are dedicated to either Lord Shiva or Goddess Parvati, the presiding deity of Himalaya. However, all these temples do not remain open throughout the year and that is why it is always advisable to plan a trip considering the weather condition that is prevailing in the region at that time.